I am the author of the Realmwatch app for webOS devices. 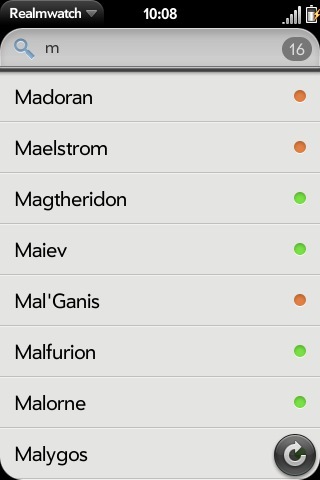 Realmwatch allows you to view the World of Warcraft® Realm Status feed from on your Palm Pre or Palm Pixi webOS device. If you have questions about this beta application, please email me at annika@sixohthree.com. Realmwatch may be downloaded to your phone using the Palm Beta App Catalog. 1 February 2010 – Realmwatch v0.1.0 release to Palm Beta App Catalog. I may not be a lawyer, but I do know that World of Warcraft® is a registered trademark of Blizzard Entertainment, Inc., and this app is neither approved nor supported by Blizzard. This page was created on 1 February 2010 . Version history.